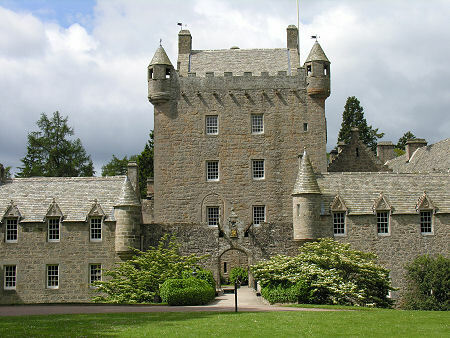 The magnificent stronghold of Cawdor Castle stands on the east bank of the steep-sided valley of the Allt Dearg about five miles south west of the town of Nairn. 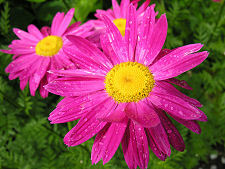 It is an extremely popular visitor attraction, and with good reason. The castle itself has an unusual layout and a remarkable depth of character: and following recent renovation is in superb condition. 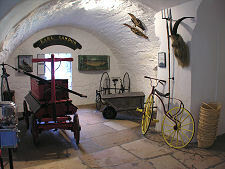 Visitors to the castle are able to enjoy an extensive tour which covers two floors of the central tower and the north and west ranges. 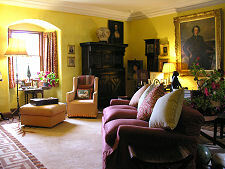 It includes a series of impressive reception and living rooms as well as a number of bedrooms, service areas and more unique features such as the Thorn Tree Room and neighbouring dungeon. 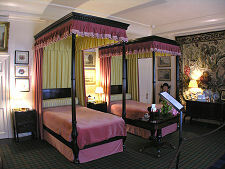 The rooms in Cawdor Castle have an unusually homely feel despite the grandeur of many of them, and great care has obviously been taken with the layout of the rooms and with the lighting to ensure that visitors see them at their very best. 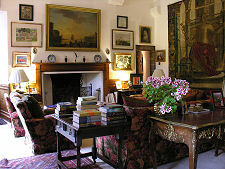 The castle also has a gift shop, a bookshop and a wool shop; plus an excellent restaurant in the castle itself, reached via the south courtyard, and a snack bar nearer the car park. 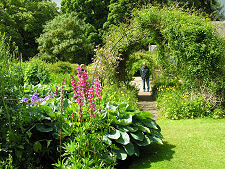 Cawdor Castle is surrounded by an extensive estate, and visitors can wander at will through the walled garden, flower garden and wild garden. There is also a picnic area, a 9 hole pitch and putt golf course, a putting green, a duck pond and an extensive area of natural woodland through which you can follow a series of waymarked nature trails of different lengths from three quarters of a mile up to five miles. 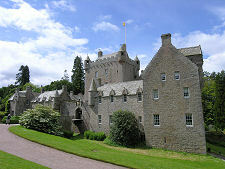 The story of Cawdor Castle is intimately connected with the story of the Thanes of Cawdor. The ancient title of Thane, roughly equivalent to "Baron", was once common across Scotland and in about 1180 William I of Scotland appointed the first Thane of Cawdor (or Calder) to be Sheriff and Hereditary Constable of the royal castle at Nairn. 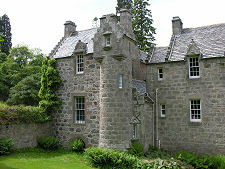 Later Thanes moved their residence to a small castle at Old Calder, about a mile and a half north east of modern Cawdor on a site defended by marshy land. In 1310 William, 2nd Thane, had his title confirmed by Robert the Bruce in return for an annual levy of £8. This castle seems to have fallen out of use in about 1400 and no trace of it now remains, even as a name on modern maps. It was probably William, 3rd Thane of Cawdor, who decided to build a replacement castle on a less marshy site than its predecessor. The story goes that in about 1370 he set out to locate the site for a new castle. Following instructions received in a dream he loaded panniers of gold on the back of a donkey, which he then followed as it roamed across his lands for a day. When evening came the donkey lay to rest under a tree on a higher and more rocky site close to the steep-sided valley of the Allt Dearg. There William built his castle. 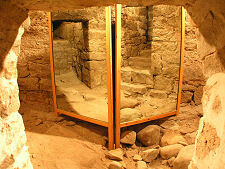 What emerged was a four storey tower house of the sort being built across the length and breadth of Scotland at the time, surrounded by a courtyard which was itself defended by an outer barmkin wall. 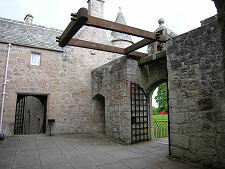 The courtyard would have been occupied by a series of domestic buildings and a great hall. 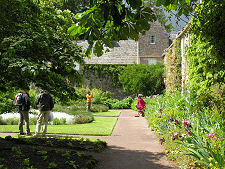 One oddity of Cawdor Castle was that it was built around the hawthorn tree under which the donkey rested. 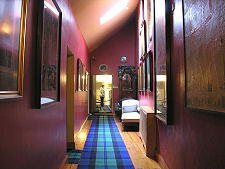 This subsequently became a feature of part of the cellar, known ever since as "The Hawthorn Room." 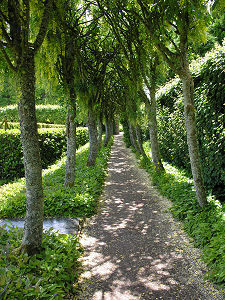 Legend has it that the tree has magical qualities which have on more than one occasion saved the castle from disaster. Modern scientific analysis has revealed that the tree died in about 1372, presumably as a result of being deprived of light following the building of the castle: and that it is a holly and not a hawthorn. 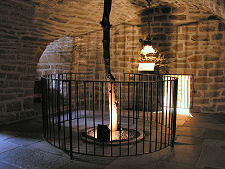 It is strangely moving to see the tree still standing in the cellar after all these centuries. There is actually some debate about when the castle was built, caused by the existence of a "license to crenellate" issued by King James II to William, 6th Thane of Cawdor, in 1454. Some view this as the date at which the castle was built. It seems more likely that this licence was issued either to regularise an existing castle, or to allow its defences to be improved: and there is evidence that some of the defensive structures around the top of the central tower were built some time after the tower itself. 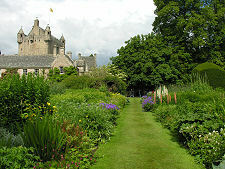 By now the Thanes of Cawdor were a powerful and wealthy family with extensive estates in the area. 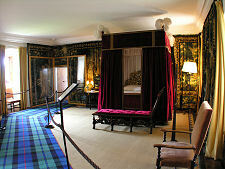 William, the 7th Thane, married Margaret Sutherland of Dunbeath Castle, increasing the family's influence further. John, 8th Thane of Cawdor, died young in 1498, leaving as his heir a daughter, Muriel, who was born after his death. The great and not-so-good of Scotland suddenly realised that control of the title, lands and wealth of the Thanes of Cawdor would go to whoever had control of this infant girl. 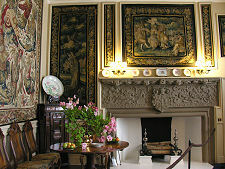 Muriel was therefore kidnapped on the orders of Archibald Campbell, 2nd Earl of Argyll and taken to Inveraray Castle. 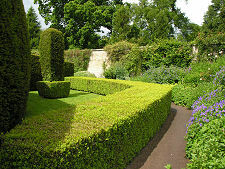 When she reached the age of 12 in 1510 she was married to Archibald Campbell's younger son, Sir John Campbell. The outcome of this unpromising union was a surprisingly successful marriage, and the start of the line which has led directly to the current Campbells of Cawdor. 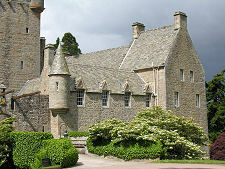 Muriel was the only Thaness of Cawdor, and she lived with her husband in the Campbell heartland of Argyll until 1523 when events forced them to move north. A certain Lachlan Cattanach Maclean of Duart Castle had married Sir John Campbell's sister Catherine in about 1520 and, after blaming her for their inability to have children, tried to kill her by stranding her on a tidal rock. She was rescued and Lachlan Cattanach was found stabbed in Edinburgh on 10 November 1523. Sir John Campbell was widely believed to have committed the murder in revenge for the attempt on his sister's life. 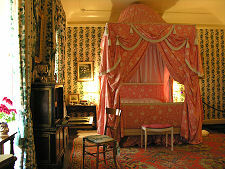 In the aftermath, Sir John and Lady Muriel took up residence at Cawdor Castle while the dust settled. Here they were faced by Muriel's four uncles, determined to ensure there was no Campbell takeover of Cawdor. The uncles and their followers besieged the castle, but withdrew after two of them were killed. Sir John Campbell went on to consolidate his hold on the area, later adding the Barony of Strathnairne to his other holdings. Following generations of Thanes of Cawdor became, in effect, a junior branch of the Campbells of Argyll, a situation which increasingly drew them into roles of responsibility in the Campbell heartland. 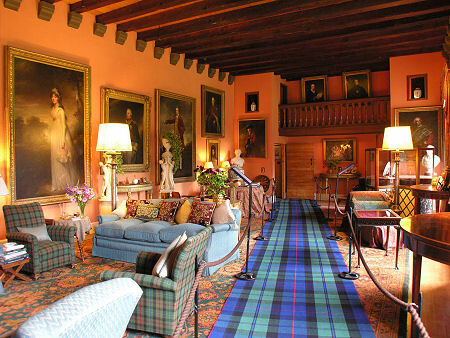 Sir John Campbell, 11th Thane of Cawdor spent a considerable amount of time at Inveraray Castle as the tutor and part guardian of the young Archibald Campbell, later the 7th Earl of Argyll. 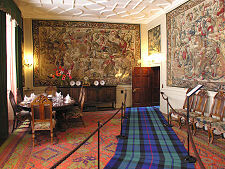 This helped ferment intense jealousies within Clan Campbell and on the night of 4 February 1591, Sir John was shot at close range with a blunderbuss while staying at Knipoch House, south of Oban. This and another murder were part of what was in effect a failed coup within Clan Campbell. The divisions were later covered over by a series of marriages between the younger generation of the different branches of Clan Campbell. The 12th Thane of Cawdor, another Sir John Campbell, purchased the Isle of Islay from the MacDonalds in 1612, though he needed the support of troops and warships of King James VI to actually take possession of it in 1615. Sir John found his new acquisition was a huge drain on the family finances. 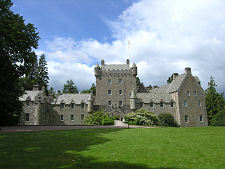 Despite his financial difficulties, Sir John was able to extensively renovate Cawdor Castle over the following four years. He also funded the building of nearby Cawdor Church in the village of Cawdor. In 1645 a Royalist army under the command of James Graham, 1st Marquess of Montrose, defeated a Presbyterian Covenanter army at the Battle of Auldearn, six miles from Cawdor. 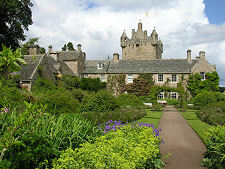 In the aftermath they attacked Cawdor Castle because of the Thane's well known Presbyterian sympathies. 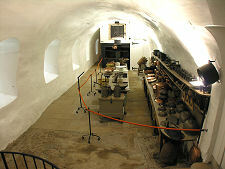 The castle survived undamaged, perhaps because of the presence of the magical tree in the cellar. Sir Hugh Campbell, 14th Thane of Cawdor, succeeded to the title in 1654 and came of age in 1660. 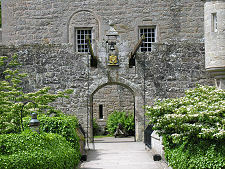 Sir Hugh had nine children and an extensive household to accommodate and between 1684 an 1702 undertook a major programme of expansion at Cawdor Castle. This was largely funded by the increasing success of the family's cattle breeding tenants on Islay, who each year drove huge herds of cattle to market in Falkirk and Crieff. 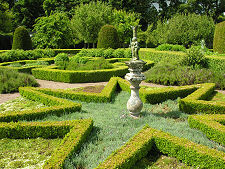 Sir Hugh died in 1716 and his successors effectively became absentee landlords of Cawdor for more than a century. The 15th Thane, Sir Alexander Campbell, married the heiress to the huge Lort estate in Wales, and this was duly inherited by his son John Campbell, 16th Thane of Cawdor, and a Lord of the Admiralty and the Treasury. He sold the island of Islay and the family estates in Argyll, and through marriage consolidated his landholdings in Wales. The 18th Thane of Cawdor, John (or Jack) Campbell was made 1st Baron Cawdor in 1796 for his political support for the Prime Minister, William Pitt the Younger. The following year he led the local militia who captured the French forces landing at Fishguard in South Wales. In 1827, King George IV promoted the 2nd Baron Cawdor (and the 19th Thane) to become 1st Earl Cawdor. He and his son the 2nd Earl took more interest in Cawdor Castle, and oversaw a series of repairs and expansions which, by 1884, left the Castle substantially as you see it today. The story of the Campbell Thanes of Cawdor in the 20th Century was one of military prowess. 12 members of the family fought in the wars of the first half of the century, and between them were awarded six Military Crosses, fifteen Distinguished Service Orders and three Victoria Crosses. 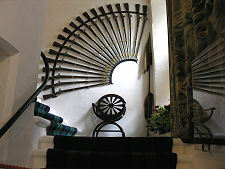 One name often associated with Cawdor Castle has not been mentioned in this story. Macbeth was King of Alba from 15 August 1040 to 15 August 1057. In Shakespeare's play named after him, written in 1606, Macbeth encounters three witches who hail him as "Thane of Glamis" and "Thane of Cawdor", and tell him he will "be King hereafter". The origins of this story date back 200 years before Shakespeare's time, and in its original form referred to the Thanages of Cromarty and Moray. The names were changed to Glamis and Cawdor by a historian writing in 1527, apparently because they sounded better, and it was this version of the story on which Shakespeare based his play. The truth is that Macbeth died 130 years before the title of Thane of Cawdor was first granted, and over 300 years before the first stone was laid at Cawdor Castle. He has, perhaps sadly, no connection whatsoever with any Thane of Cawdor, or with Cawdor Castle.